Northeast Edmonton homes for sale have the advantage of being in a location that is convenient while also experiencing a fair amount of growth. This thriving community is known by locals as “The City of Champions” and offers everything from single-family homes to condominiums and everything in-between. The opportunity for any kind of real estate is here in Northeast Edmonton, making it the perfect place for first time homeowners, empty nesters, retirees, and many others! Register with us and gain access to the search features and tools on our website that will help you prepare for buying or selling in Northeast Edmonton homes for sale. Search other areas in the city as well to gain an understanding of the market comparables. Golf communities, homes backing out into the woods, and new developments offering great views of greenbelts are all characteristic of Northeast Edmonton homes for sale. Single-family homes tend to be on quite large and have plenty of room for families big and small. More opulent homes have features such as heated garages, designer laminate floors, granite counters and more. Homes at more affordable price points include stylish condos and townhouses that are close to essential amenities and transit. Prices start at around $50,000 and go up to more than 1 million dollars, meaning that Northeast Edmonton real estate offers a broad variety of homes and styles to choose from. For the nature lovers, the area around Ravencrest Golf & Country Club is spectacular and full of wildlife and bird watching opportunities. Golf is just a great bonus! Homes in this area tend to be single-family homes, many of which are situated at the end of peaceful cul-de-sacs. Even better, the North Saskatchewan River offers jaw-dropping waterfront views. If you want a place closer to the hustle and bustle of city life, then check out neighborhoods like North Edmonton, Montrose, and Newton. Here, you can find condominiums and townhouses, as well as single-family dwelling. You can also have access to all kinds of nearby amenities like Dollarama, A&W Canada, and RBD Royal Bank. Outdoor recreation is one of the most popular aspects of life in Northeast Edmonton. There is no shortage of hiking trails and certainly no shortage of beautiful parks. 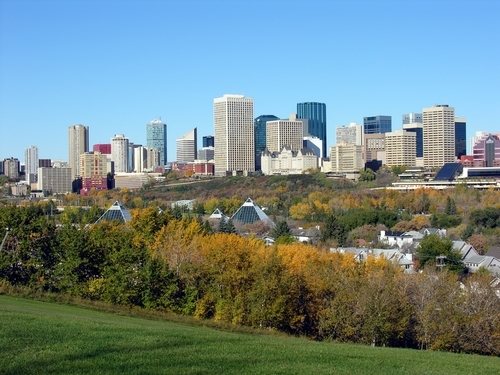 Set alongside the North Saskatchewan River, there’s no place more picturesque in all of Edmonton. The number of Parks in this region is absolutely phenomenal, and one of the largest is Tiger Goldstick Park. Here, you can have full access to public hiking trails, swimming holes in the North Saskatchewan River, and just get away from the city for a while. It’s the perfect place to unwind!